Sometimes, it pays to look beyond the world of currencies when trading forex. After all, there is such a thing as intermarket correlations. As we learned from the School of Pipsology, commodities, bonds, and equities can also affect forex price action. Studying these markets’ relationships with currencies sometimes allows you to identify and capitalize on trade setups that you wouldn’t otherwise notice. For Australian dollar traders, keeping track of the price of gold is critical as the currency often moves in the same direction as the yellow metal. In fact, it’s not unusual for gold to lead the way and act as a sort of leading indicator for AUD/USD. You may be wondering why these two share such a strong positive correlation. It’s all about Australian exports, baby! Australia happens to be the world’s third largest gold producer. In fact, it exports about $5 billion worth of the precious metal every year. Since Australian dollars are needed to purchase gold from the Land Down Under, as the demand for gold rises, the demand for Australian dollars usually follows suit. This is why AUD/USD historically shares an 80% correlation with gold. Sure, the Australian dollar and gold may have shared a tight bond in the past, but how has their unique relationship fared this year? Does the correlation still hold true for 2013? To a certain extent, we can say that the two still move to the beat of the same music. Looking at the charts, you’ll see that on more than one occasion, they moved in the same direction – sometimes with gold leading the way. But you’ll probably also notice that there were a few instances when the two didn’t exactly jive. The first two months of the year were bearish for both markets. However, gold bottomed out towards the end of February, while AUD/USD continued dropping for another week or so. 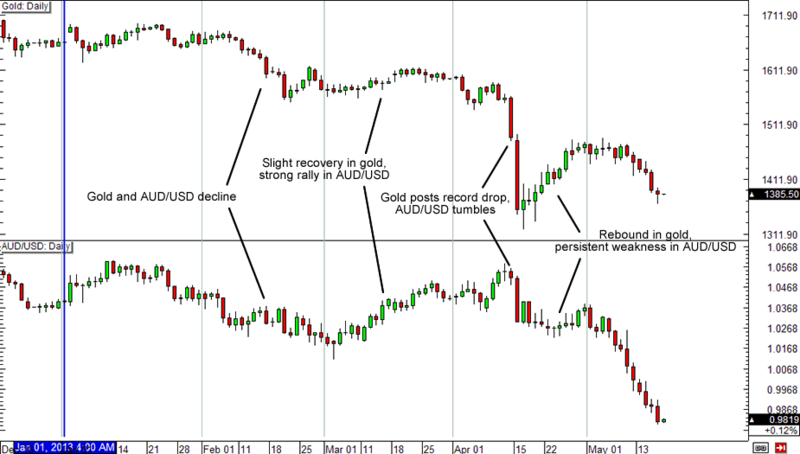 In March, gold staged a small rebound, but the rise on AUD/USD during the same period was much more pronounced. Then in the middle of April, we saw a massive drop in gold prices as the precious metal staged its biggest decline in three decades. Concerns that Cyprus and other European countries would dump their gold holdings put downward pressure on gold prices. And with global inflation dying down, gold’s value as a hedge against rising prices dropped as well. What followed next was a classic case of panic selling, which was subsequently followed by a decline in the Australian dollar. But after that, the two sort of went their separate ways. Gold recovered a bit and is still trading above its lows. On the other hand, AUD/USD fell straight down and is still forging fresh lows. Alongside the slight recovery in gold prices, we’ve been seeing continued and persistent weakness in AUD/USD stemming from weak Australian fundamentals, the RBA rate cut, and the Fed’s apparent willingness to withdraw stimulus from the economy. This just goes to show that just because gold moved in one direction doesn’t necessarily mean that the Australian dollar will take the same path. Gold may have a hand in determining AUD/USD price action, but it isn’t the sole determinant. Always remember that fundamentals and monetary policy also play a very important role in driving the forex markets and should never be overlooked. Where do you think gold and the Australian dollar are headed?